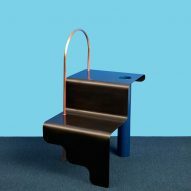 Designers from Norway and New York have worked together to create a collection of playful items, which will be shown during this month's NYCxDesign festival. 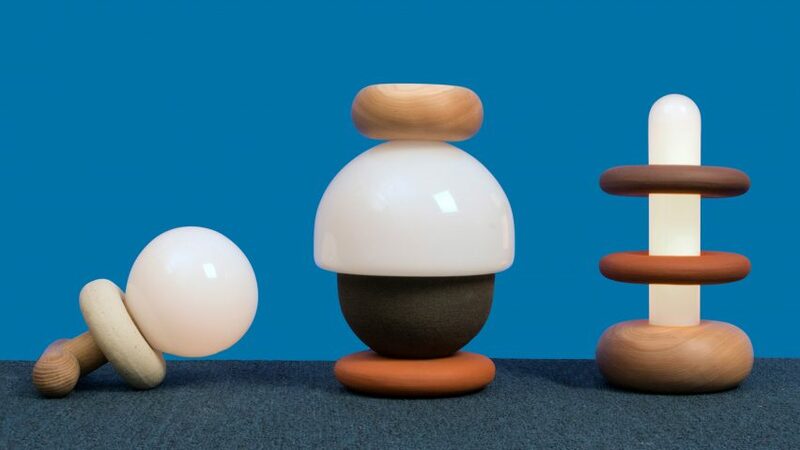 The third edition of Norway x New York involves seven pairs of designers and studios, each invited by Sight Unseen to collaborate remotely over six months on an object for the exhibition. "For this year's instalment, the brief was less about an education in how to get things made and more about the true spirit of collaboration," said Sight Unseen founders Jill Singer and Monica Khemsurov in a statement. 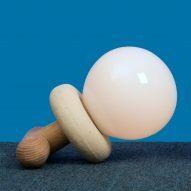 Norway x New York forms part of this year's Sight Unseen Offsite – a collection of exhibitions on display at 201 Mulberry Street, 17-20 May 2018. 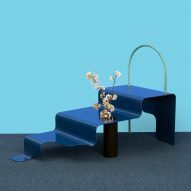 The shows coincide with the annual NYCxDesign, which takes place across the city from 11 to 23 May 2018. 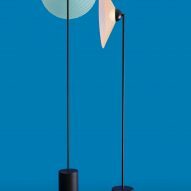 A pair of minimal floor lamps came out of the pairing of Souda and Stine Aas. 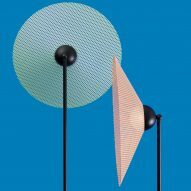 Named Cosmos, the lights feature slender black stems made from milled aluminium, and cone-shaped, perforated metal shades – one baby blue and one pale pink – around ball-like LEDs. 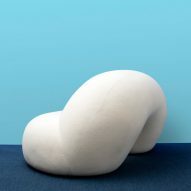 This squishy white lounge seat is formed from two interlinked tori, which fall to create a low chair. 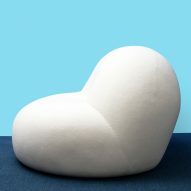 Objects of Common Interest and Falke Svatun wanted to create an larger item that would make an impact in an interior. "We looked at a lot of references from art rather than design during our virtual brainstorming sessions," the designers said. Trueing and Andreas Bergsaker compiled a series of curved vertical forms made from Douglas fir into a lighting piece. Assembled as taller and shorter connected pairs, the grouping's outer fins are dyed different colours but both incorporate LEDs that shine onto their partners. The pine Tambour Cabinet by Paul Loebach and Jonas Ravlo Stokke started life based on metal storefront shutters and ended up influenced by rolling wooden doors. 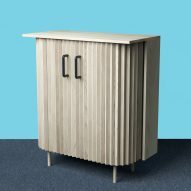 "We came to see this traditional carpentry technique –featured most prominently in 18th-century roll-top desks and Scandinavian modern cabinets – as the crafty predecessor," said the duo, who designed the storage unit for both home and office. 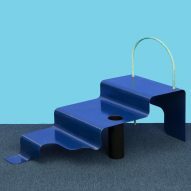 Kin & Company and Henrik Ødegaard's object is part stair, part chair, and the serendipitous result of ideas that both had already for similar wall-leaning designs. 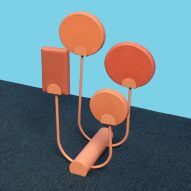 Made from sparkly folded metal and supported in the middle by a vertical tube, the set of wavy steps can be used for displaying items or sitting on. This metal candelabra was influenced by Russian suprematist art, and comprises U-shaped branches and small folded holders. Eny Lee Parker and Kaja Solgaard Dahl fabricated the design in Brooklyn, and created silicone moulds to produce the scented geometric candles that fit onto the array. 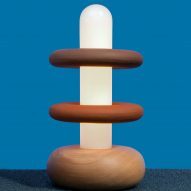 Combining their different materials of choice, Pat Kim and Ann Kristin Einarsen created a trio of totem-like lamps using wood and ceramics. Both materials are turned during production, so this naturally resulted in rounded and cylindrical forms for each element of the stacked designs.